Announcing a new product designed specifically for the car wash market – a wall mount system consisting of a carbon filter, RO, and repressurization pump, integrated into a simple package. We polled our top customers and their installers to learn what was lacking from competitive products and came up with the most time-saving design on the market! Quick disconnects for all wiring, a simple solid state control for the entire system, city water bypass solenoid, PLUS, all components are resistant to the harsh car wash environment. To make things even easier, the high and low level float switches are included with every system, as well as plumbed quick connect hose connections between the water storage tank and repressurization pump. ECI provides water pretreatment systems for car wash applications in the form of water softening, carbon filtration, and reverse osmosis (RO) for the spot-free rinse. Successful car wash operators understand the importance of a highly-efficient, low maintenance pretreatment system that ensures a spot-free rinse – which is why they come to Ecodyne. ECI has successfully served this market for many years, with installations throughout the United States and Canada. Our Carbon Filters, Softeners, and Reverse Osmosis systems are globally recognized as the best products for this demanding application. 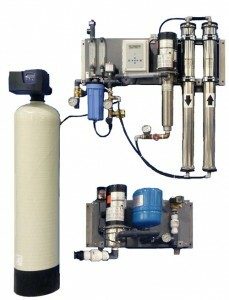 ECI is a premier provider of water treatment solutions for car wash applications. Receive expert advice on the best solution for your water challenges.